The Jesus Lizard Robot In the News! This is the paper they wrote, A Novel Water Running Robot Inspired by Basilisk Lizards. It has all the necessary science and equations useful for imitating the work. If you learn anything from the paper, you should reference the paper. If you learn anything from this webpage that was not in the paper, reference the paper and you can also reference this page if you want. And here is the official site, CMU NanoRobotics Lab, Water Runner Robot. What I can offer that those two links do not is pics and video of the earlier work I did on the project, and a quick rundown of the basics. If you do not yet see the videos (and instead see large blocks of white nothing-ness), please wait a few seconds for them to load. There really is no purpose for this project other than trying to understand a really hard robotics problem. This robot is planned to bipedally run several meters a second on water. Yet today, the most state of the art robots can barely walk on land. This is not easy!!! Anyway, I cannot think of any useful applications in the near future with this robot other than a really neat remote control toy, or an amphibious robot as it can walk on both land and water. Using what we have learned and documented, this is easily possible now for anyone willing to try. Video of the Jesus Lizard from Tonia at Harvard. She has spent the last few years trying to understand why the lizard can run on the water, from a biological point of view. I ran into her by complete accident while visiting her lab for my robot fish project with the Navy. She was quite excited when she found out someone was using her paper on Three-dimensional Hindlimb Kinematics of Water Running in the Plumed Basilisk. The typical Jesus Lizard ranges in size from less than 2 grams (adolescents) upon hatching to more than 200 grams as adults. Throughout their size range, they can run across water on their hind limbs at about 1.5 meters a second for a distance of approximately 4.5 meters before they sink to all fours and swim. What is interesting is that no matter the weight, they all run at the same velocity with the same leg frequency of about 5-10 Hz. But as they get larger, running becomes only more difficult (explained by scaling laws). What the Jesus Lizard does is slap really hard on the water and push with a force greater than its own weight to stay above water. The reason why the robot still does not fully work is because of control. I tried for almost a year to make it mechanically balance itself while running. The two legs are mechanically linked together for synchronization, meaning the entire robot has a single degree of freedom. 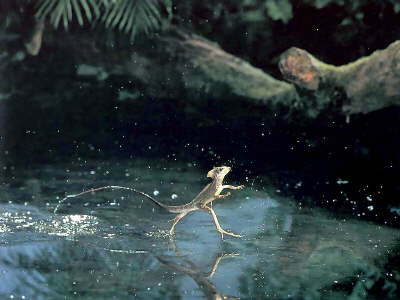 I was hoping that a tail dragging in the water (as the actual lizard often does) would give it balance. But no luck. However, the two students who continued the project after me got the really neat idea of using four legs - much more stable, and supposedly can carry much more weight as well. I think if anyone were to continue the project, they should pursue the 4 legged version. This is the four bar linkage we made, designed in a simulator. We made a mechanical test video for it, but it would be neater if you just look at the coming videos to understand how the 4 bar linkage really works. Why a 4 bar anyway? Well a DC motor only gives rotational motion, but the lizard foot path is not rotational. What the four bar linkage does is convert that rotational motion to the correct foot path motion, and to do it so as to push down on the water at extremely high speed. In the below 4 bar simulation image, the red dots are the joints, the red line is the foot tragectory, the blue lines are the link lengths, and the black lines are the links moving as the motor rotates. update: I decided to design a 4-bar linkage simulator using the Phun physics simulation tool. V1 This video is my first in water test for the 4 bar linkage. It consists of a 4 bar, a large motor, and batteries as the counter weight. As you can see, it creates both lift and forward thrust. Unfortunately the low quality streaming video prevents you from seeing the leg on water very well. V3 After proving the 4 bar leg idea works, it was time to build the robot. This video is version 3 (because styrofoam v2 didnt work), made out of pink foam core and HDPE. The problem with foam is that it is not rigid, so the gears kept coming unmeshed. It is also a good thermal insulator, effectively causing my motor to overheat and sadly fry. The weight was about 70 grams. V5 Versions 4 and 5 were then made using the technique of transparent styrene vacuum forming. The weight was about 30 grams. Version 5 worked better, so here are two videos of it. 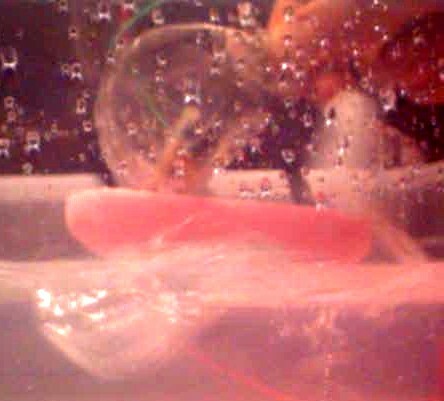 The second video was done in water, but the motor wasn't strong enough to support it's on weight. V6 Version 6 was similar to version 5 in design, but this time I tried a different type of vacuum forming material. It turns out the transparent styrene was less likely to crack, but the white styrene looked better . . . The feet were also vacuum formed this time, and the legs are no longer made from heavy plastic but instead of carbon fiber. Weight was dropped down to about 25 grams. What is great about vacuum forming is that now I can mass produce the robot chassis. Here is a cutaway image of the motor and gears inside the vacuum formed chassis. The carbon fiber legs were held together by screws and locktite. Despite the high vibration, the screws did not come off. But looking back, I should have used plastic locking joints instead. V7 Version 7 is basically the same as version 6, but the weight was dropped to 20 grams and the gear efficiency was greatly improved. This video was done in black and white, with white marks showing the foot and the joints and the body colored black. This way I could trace out the exact path the foot was traveling, and use the video frame rate to calculate foot speed at any point. Towards the end of the video you will see the pear shaped tracing of the foot path. Two more images of v7. The left image is the traced path using a long exposure time. The right image is from using a stroboscope. V8 Version 8 is again like version 7, but now the 4 bar linkage was reoptimized accounting for foot angle with respect to the water surface. In this video I tried really hard to get it to run across the water but it just would not stay balanced. It would quickly fall over backwards and instead of running, would swim really fast. As a last minute fix I added a foam balance under it, but with no luck. I couldnt figure out how to design a tail properly for balance either. This was my last prototype - but at least it was shown to support its own weight in the water and worked with the exception of balance! 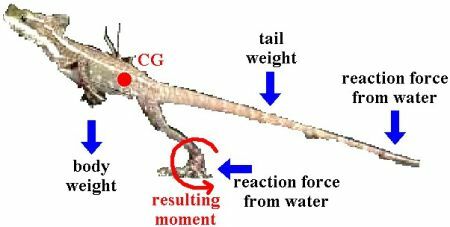 If you look at the foot in the water, you will see the all-important air cavity forming - necessary for a robot to run on water as explained in the A Novel Water Running Robot Inspired by Basilisk Lizards paper. Unfortunately, I did not have access to a high speed camera, so the image is a little blurry. Balance is why I think the four legged design will work much better. Aubrey Shick for teaching me everything I know about vacuum forming and foam core. Jason Smoker for help with version 1, and your significant contribution to the 4 bar linkage idea. Bahareh Behkam for help with the fluid mechanics calculations. Prof. Metin Setti for being my advisor and sponsoring the project.